Luz House is a gorgeous 250-year-old colonial, Dutch bungalow right in the heart of the city. Learn yoga, pose for your pre-wedding shoot or even have your big day at this bungalow. Plus, did you know scenes from Mani Ratnam’s OK Kanmani were shot here? Here’s a little history lesson. This majestic property harks all the way back to the 1550s when the Portuguese first landed in India. Back then, Luz House was not so much of a house, but barracks for the Portuguese armed forces. It then went on to become a Dutch house, followed by the British. 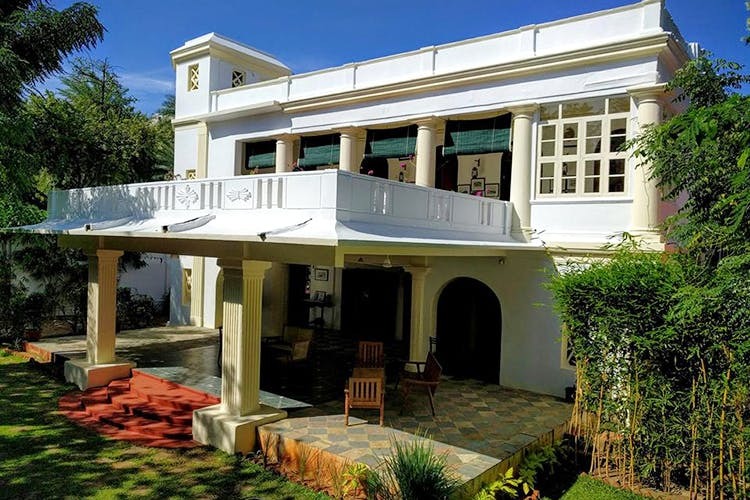 The property was then acquired from the British by the ancestors of the present owner, Abhimanyu Prakashrao who happens to be the sixth generation proprietor of Luz House. The stately white villa comes with beautiful, regal pillars, a colonial style porch, and high ceilings. The villa comes with an old world charm and as you walk around, you can notice original brass switches on the wall, doors made of the finest wood, and red oxide floors with tiles from yesteryears. Great effort and care have gone into the restoration of this vintage bungalow with antique furniture, air conditioning and ambient lighting. Together with the Rutland Gate Yoga Studio, Luz House brings to you an opportunity to learn and practice yoga, within the walls of this ancient home. They offer Hatha yoga and Ashtanga yoga batches running through from Monday to Friday. One can either opt for membership or take up a single yoga session on any day of the week at the cost of INR 1,000. They also have a teacher-training course on Hatha and Ashtanga Yoga. If yoga (or fitness in general) is not your thing, worry not! There’s plenty more that Luz House has to offer. From weddings and sangeets for about 60-150 guests and even films and photoshoots (for your pre-wedding shoot), you can have it all at Luz House. It is also a stellar location if you just want to quickly get away from the pressed city life while still in the city! Luz House also hopes to get its very own cafe and boutique hotel soon. While plans for the cafe are already underway, the boutique hotel might be on its way a little later. Anybody is free to go visit the heritage home so, head out to Luz House for a poppin’ Insta story.